Hibernate Query Cache Example shows you how Query Cache works with Second level cache. 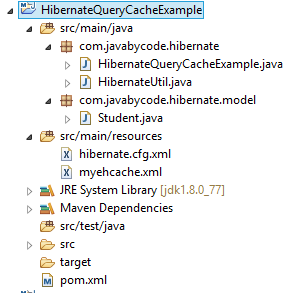 Hibernate Query Cache is used with Second level cache but it does not cached the entities unlike Second Level Cache. Query Cache is caching the combination of query and values provided as parameters as key, and list of identifiers of objects returned by query execution as values. Notice that Hibernate will load objects using cached identifiers from second level cache. In this example, we are using EHCache for second level cache. This configuration makes sure that EHCache works normally. As you see above, we need to enable query cache in java program by setting cacheable true like this below main class. Hibernate: select student0_.id as id1_0_, student0_.CODE as CODE2_0_, student0_.ENTERING_DATE as ENTERING3_0_, student0_.NAME as NAME4_0_, student0_.NATIONALITY as NATIONAL5_0_ from STUDENT student0_ where student0_.id=? Step 1: Query cache is set false, by default. We load student object by query and query log is fired. Step 2: Query cache is set true. Then we load student object by query again. As you see that query log is still fired here. It means that the student object is not stored yet in query cache before (step 1). Actually, the student object is just stored in this step 2. Step 3: Query cache is set true. One more, we load student object by query and query log doesn’t appear. It means that student object is load from query cache. That’s it on the Hibernate Query Cache Example.